A friend of mine paints barns. That is, she makes paintings of the same barn over and over, in all seasons and at all times of day. The angle of her view may shift or the size of her canvas, the palette, or the medium, but the barn remains, a presence in the landscape. In fact, it feels inseparable from the earth, as if she was a painting a mountain or a great tree. Brenda Cirioni’s barns are rooted and alive. When I was sixteen years old my family home burned to the ground. 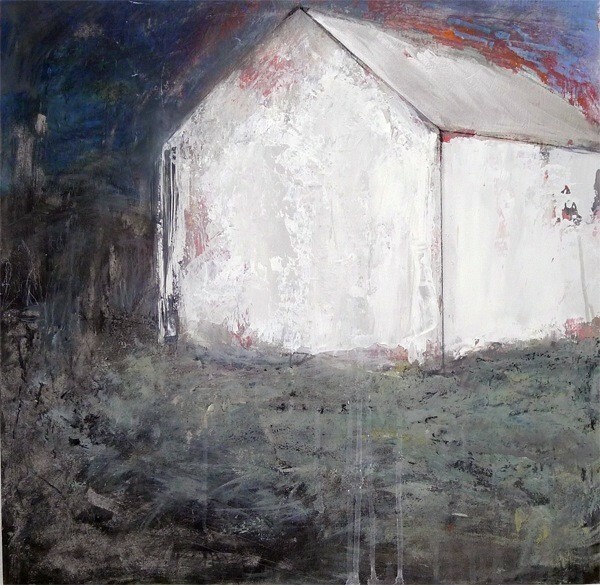 Memories of that experience – both visual and visceral – surfaced in 2012 and found expression in Barn Series. It was years after the event that Brenda realized that she had never truly mourned that frightening loss. Painting is a way to heal our wounds, even the hidden, unarticulated ones. As artists, we are fortunate when we find a subject that captivates us. Like many people, I have an attraction to the natural world, to old objects and worn tools. Growing up with an anthropologist mother and traveling with her to Mexico and Guatemala, as well as to India and Papua New Guinea, I learned to respect material culture and appreciate how it reveals information about people and their worlds. I have a natural affinity for old objects and textiles because they connect me to my childhood and early adolescence. I use them in sculpture, often combining them with small figures. I play. I think of art as a form of play that connects our inner and outer worlds. Children play naturally. Children like to arrange things, to build towers, to line up stones on a beach, or arrange a series of stuffed animals on a shelf. Artists, when painting a landscape or making a sculpture, also arrange objects. Brush strokes form buildings or trees, people or abstract shapes. If I want to paint grasses that are dark green at the bottom and become pale above, I stroke the canvas with color in a particular pattern and with an intensity and intentionality to recreate the density of green below and the lighter colored, thinner reeds above. It’s the way I imagine Brenda paints a barn, filling her brush with color and forming the angles, the light, the textures — all with intuitively complex decision making that no one else can replicate. It’s authentic playing — the playing of an experienced artist. When we are self-conscious and trying too hard at this art making, it feels all wrong. It’s only when we find the sweet spot that has similarities to child’s play that discoveries happen. I have a friend who has recently become obsessed with mosaics. She has a tree stump on which she hammers stones to break them down into small mosaic pieces. She then fits them in patterns, setting the stone shards in cement. She loves this work — and can’t find enough time to spend at her mosaic table. She is tapping into her true self. As she breaks these rocks from the earth into small pieces and arranges them in a specific way with colors and shapes, I feel like she is breaking down difficult places in the world and creating peace — like she is breaking down the hard places inside of herself and turning them into art. Children play with stones, soil, sand, containers, the contents of the kitchen utensil drawer, anything that they can pick up. When we become an artist, we reconnect with that innocent and serious play. Many of the sculptors exhibiting this year at the farm’s annual sculpture exhibit play seriously in this way. Barbara Andrus strung curly willow twigs across the pond. Is this so different than lining up teddy bears? Of course it is – and there is much more work involved and commitment to her vision, but the essence is still there. We’re fortunate when we find a medium that appeals to us and that we can work and develop. Alicia Dwyer’s Dyads are eyes that peer out from among the forest trees. They seem to be staring at us as we walk along the path; we have the uncomfortable feeling of being followed. Painted on aluminum flashing, the Dyads were made eight years ago, her first time working with aluminum. She has continued with this medium, creating armor women, and this year, a new piece in which beautiful butterflies suspended in captivity remind us of the refugee problems in many parts of the world. My daughter, Ariel Matisse, has found that wire is her chosen medium of expression. For the sculpture exhibit, she’s making a willow tree growing out of a hollow tree stump. The willow trunk is a twisting shape made from a fistful of long wires, where one end forms the branches and the other the roots. She uses a ball peen hammer to flatten and make the branches reflect light. She grew up watching me drag tree trunks home from the woods or from a trip to Cape Cod. I can easily see my influence on my daughter and also how her own truth leads her in a new direction. On Samantha Pasapane’s website she writes, “I love steel.” Samantha will be bringing a new sculpture in her Savaging Series to the farm. 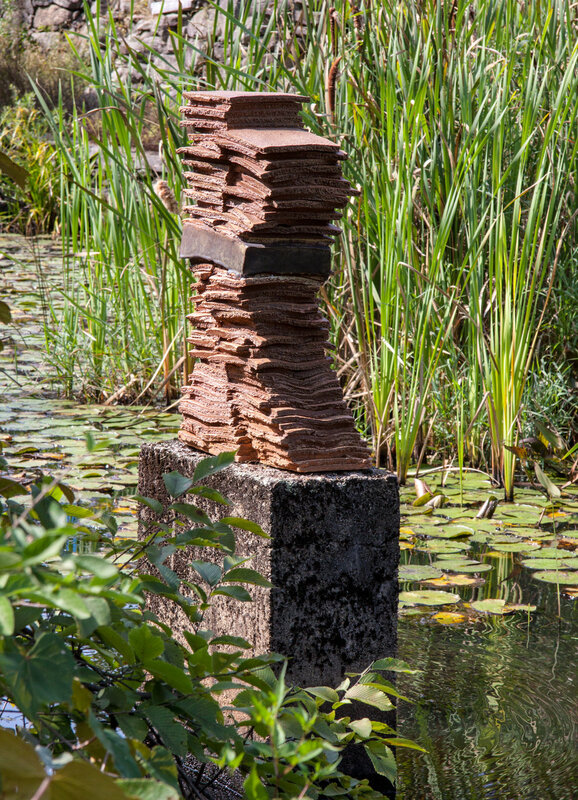 Lydia Musco has already installed her sculpture, Organizing Echoes with Ash, on the concrete pier in the middle of the lower pond. The title of her sculpture suggests ‘creating order.’ Lydia’s column is made of ceramic tiles that she combines and stacks. Her sculpture, though abstract, entices the viewer to linger with its physicality. I see a figure or even two figures together, and then when I look again, it seems to be echoing the play of light on the rippling water. Art making connects us to something original inside us, to a truth about who we are and how we relate to our world as human beings from our very origin. Brenda Cirioni’s most recent paintings are what she calls Spirit Houses. They seem a natural progression from the Barn Series. In these paintings, the landscape with identifiable trees and grasses is gone, but the body of the barn remains without the old story. In the painting above, the white shape is floating as if on a sea. It’s haunting and surreal, yet familiar, a space we have all inhabited — one where we just don’t know. That’s when there’s nothing left to do but find a medium that resonates — words, paint, wire, clay, even fruits and vegetables — and get down to some serious play. Old Frog Pond Farm's outdoor sculpture exhibit opens on Friday, September 8 and will be open every Friday, Saturday, and Sunday through Columbus Day. Hours are 11-5pm and admission is $7. Join us for an opening reception and meet the artists on Sunday, September 10 from 1-4pm. In the next few weeks I will be writing about more of the artists and fall activities. Join us at the farm!